Cashless payments refer to financial transactions that are conducted through the transfer of digital information between the involved parties, rather than money in physical form, such as banknotes or coins. The trend gained in popularity during the 1990s, with the emergence of electronic banking. Nowadays, cashless payments are widespread in many countries and the volume of transactions has increased significantly over time. In 2015, transactions performed with non-prepaid debit cards were the most popular in the United States, with 59.6 billion of recorded deals. Debit cards, as well as credit cards are the most commonly used payment methods among all generations in the United States. 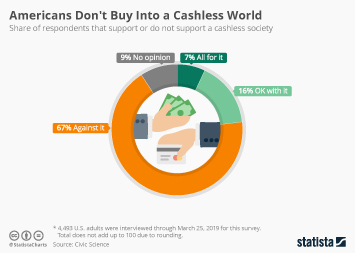 The main reasons why Americans preferred to pay with a debit card were the ease of keeping track of expenses and better management of their budget. On the other hand, credit cards were used due to rewards or points they offered and security reasons. Mobile payments and mobile banking have become an attractive and convenient alternative to cash transactions in the recent years. In 2016, nearly one quarter of Americans admitted that they frequently paid with their smartphones. The majority of respondents used their mobile phones to purchase a product online, or to check their bank account balance. Although more and more people decide to process payments through their mobile phones, there are still many security concerns regarding this transaction method. In 2015, 25 percent of Americans stated that they were concerned about the possibility of someone stealing their personal data by having their phones hacked. The most secure, as well as convenient money transfer or payment apps according to users in the U.S. were PayPal, followed by Apple Pay and Google Wallet as of July 2017. Following the boom on the cryptocurrencies market in 2017, many institutions and individuals worldwide became interested in the virtual coins. In 2017, almost 40 percent of Americans, who were familiar with this cryptocurrency, were willing to use Bitcoin for transactions and making purchases. The blockchain technology and virtual currencies might further contribute to development of online payment transactions in the future, when the regulatory und safety issues are addressed. Value of credit card transactions in the U.S.